Ever wonder if there is other life out there? 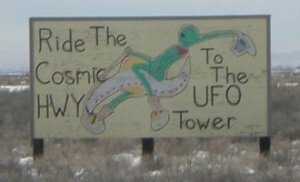 Well, visit the UFO watch tower located 22 ½ miles north of Alamosa, Colorado on Highway 17. Or click here to share your UFO thoughts. This stretch of the highway is known as the Cosmic Highway! Stop in and observe the sky and see if you see anything strange. The UFO watch tower is open daily in the summer from 9 am until dusk and is only open in the winter on weekends. The admission is $2 per person or $5 per car. There is also camping for $10 per night. When you visit the UFO watch tower you will enter a dome-shaped, adobe gift shop. As you exit this same building you will see some carefully placed rocks that are the opening to a parallel universe. Next is a healing garden outlined by rocks. Here you will see an array of items that litter the space. The garden is a give and take area and anyone who gives something is entitled to request something in return. One lady that visited the garden believes it cured her of cancer. You can also walk on the observation deck for a better view. Starting in the 1950s the San Luis Valley has had a large amount of paranormal activity. Different lights and strange moving objects have been observed in the sky. In the late 1960s, cars would line the highway at night looking towards the Great Sand Dunes hoping for a glimpse of a UFO. In 1967, Snippy the horse was found dead and really put the San Luis Valley on the map for UFO sightings. The horse was missing all of the tissue from the tip of her nose to her shoulders and a formaldehyde-like odor was emitting from the animal. The owner was convinced that flying saucers killed her horse and this brought the attention of the press. When the horse was autopsied they found a severe leg infection and bullet holes in the pelvis. This deflates the excitement of the horse being killed by aliens but was still a large press story. From this time on the San Luis Valley has been the sight of many cow mutilations as well. The animals are always found with precision like cuts, hair removed, and sometimes inner organs gone as well. Is this the work of aliens or just what happens as a carcass decomposes? There are also many records of personal telepathic encounters with people that have been traveling in the San Luis Valley. One man believes he was visited in his home two nights in a row by aliens. The lists just keep growing and more sightings keep happening. The more you read, the more it makes you think and question what else is out there. If you are really intrigued I recommend reading through Mysterious Valley and Enter the Valley, both by Christopher O’Brien. He is the San Luis Valley’s most renowned expert on paranormal activity with over a decade of research. The owner of the UFO watch tower has also written her own book, “That Crazy Lady Down the Road” which is for sale in the gift shop. Her book talks about experiences at the UFO watch tower and other alien stories. 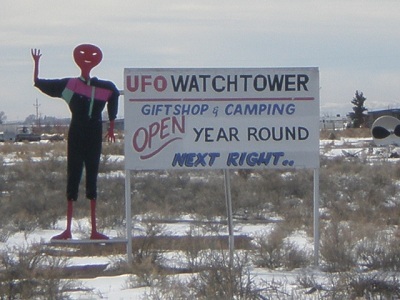 So is the UFO watch tower actually worth your vacation time? This totally depends on how interested you are in UFO’s and aliens. Personally, it is not high on my priority list for things to do when visiting the San Luis Valley but the decision rests with you. What's Your Theory Or Experience With UFOs? Experienced something out of this world? Share it!